The day after 49 people were killed at a nightclub in Orlando, U.S. President Barack Obama called on the nation to make it harder for people who might be a threat to get guns -- just as he had after other mass shootings. But gun control proposals from Obama and others appear to have no better chance of passing Congress than they did after earlier mass killings. “It’s a good bet that Congress will continue” to do nothing on gun control, said Philip Cook, a professor at Duke University in North Carolina. The Republican Party controls Congress, and most of its elected officials oppose new gun control bills, he said. The weapon used in the Orlando nightclub shootings was a Sig Sauer MCX rifle. It is a version of the AR-15 rifle and similar to the M-16 weapon used by the U.S. military. Military-style weapons have also been used in other mass killings, including the killing of 14 at San Bernardino, the murder of 20 first graders and six adults at an elementary school in Newtown, and the killing of 12 at a movie theater in the state of Colorado. Sunday’s mass killings at an Orlando nightclub and the killings at a holiday party in San Bernardino last year were carried out by people inspired by Islamic State militants, according to the U.S. Federal Bureau of Investigation. The Violence Policy Center said the rifle that Omar Mateen used to kill 49 in Orlando is the weapon of choice for mass killings. Congress should ban it and similar weapons, said Josh Sugarmann, the center’s executive director. But opponents of gun control say the AR-15 is used by millions of Americans legally for target practice, hunting and shooting competition. Anathema is a word used to say that people are strongly opposed to something. 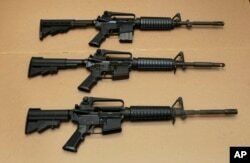 Sales of some AR-15s and other military-style weapons were blocked by a 1994 assault weapon ban. But Congress refused to continue the law 10 years later. The National Rifle Association, which opposes most gun control legislation, asked Congress to end the assault weapon ban. Robert Spitzer is an expert on gun control issues at the State University of New York at Cortland. He said many people outside the United States have a hard time understanding why so many Americans – an estimated 100 million – own guns. He explained: “They (guns) represent a feeling of American individualism, the idea that Americans don’t want to rely on others for self-protection, such as police or government,” he said. There are more guns in America than other countries. 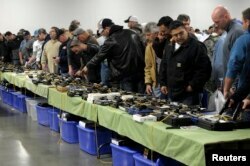 FILE - People look over a table of handguns for sale at a gun show in Kansas City, Missouri, Dec. 22, 2012. The last major study, done in 2007 by the Small Arms Survey, said the United States has 88.8 guns for every 100 people, more than No. 2 Yemen, which had 54.9 per 100 residents, and No. 3 Switzerland, with 45.7 guns per 100 people. The question of how Americans feel about gun control is complex, with both sides even disagreeing over how much regulation is permitted by the U.S. Constitution. The Pew Research Center, for example, found in 2015 that large percentages of both Democrats and Republicans favor requiring people buying guns to complete a background check. But it said many conservatives fear such legislation would lead to the taking away of peoples’ guns. A background check looks at whether someone has done something in the past – such as a violent act – or has mental health problems that would make gun ownership risky. Currently, people buying guns from private owners can avoid a background check in most U.S. states. That is the “loophole,” or exception, that Obama and others want to end. The issue of whether to limit gun purchases has become an issue in the presidential race between Republican Donald Trump and Democrat Hillary Clinton. On Monday, Clinton called for several steps. Among them: a ban on the sale of military-style weapons, better background checks and a ban on gun purchases by people on “no fly” lists because of concerns about their support of terrorism. “If you’re too dangerous to get on a plane, you are too dangerous to buy a gun in America,” Clinton said. Trump said he favored blocking people from countries with large numbers of terrorists from coming to the United States, but no new gun laws. “They tried that in France which has among the toughest gun laws anywhere in the world, and 130 people were brutally murdered by Islamic terrorists in cold blood,” Trump said. He was talking about the November attacks on a concert hall, restaurants and a sports stadium in Paris.